Dental implants offer a permanent solution to missing teeth. The implant procedure involves putting a small screw into the gum in the space where the tooth is missing. This screw acts much like your tooth’s natural roots and, after about one month, fixes itself into the bone securely. The top of the screw is then fitted with an abutment designed to match the rest of your teeth on color, size, and shape. After you get your implant, it requires minimal attention and maintenance. A missing tooth often causes the nearby teeth to shift, changing your bite and your smile. When an implant is placed, your smile is complete and your teeth will no longer move into the empty space. The implant stays in 24 hours a day, seven days a week, so your teeth always have the supportive structure to rely on. Dental implants are stronger than you might initially think. This means they are going to perform just like your real teeth. Corn on the cob, ribs, and even taffy are things you can eat. All of the foods dentists tell you to be careful with when you have dentures are considered non-issues. Because the implants don’t move, you will also feel confident eating and talking in public without worrying about them slipping out of place as dentures can. For the most part, dental implants are permanent. According to the American Academy of Implant Dentistry (AAID), compared to traditional dental bridges that only last 10 years on average, dental implants can last a lifetime when properly cared for. Unless some freak accident occurs, the dental implants are not going anywhere. They are attached to an anchoring system on your jaw bone, so once put into place, you don’t have to worry about having them resized or replaced at any point in time. 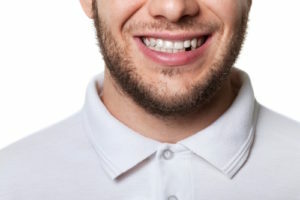 Unlike bridges, dental implants are installed on their own without requiring any reshaping of nearby teeth.The reshaping process damages teeth and weakens their structure. Dental implants provide a lasting solution to missing teeth without damaging your existing natural teeth. As an added bonus, cavities can’t occur in an implant replacement tooth. Of course, you’ll still have to see your dentist on a regular basis for cleaning and care of your gums and other teeth. If you’re dissatisfied with a missing tooth and wish to explore a permanent solution, contact Overland Park Dental today for a consultation. To schedule an appointment, you can reach our south office at (913) 647-8700 or our north office at (913) 341-2380. Let us help you improve your smile.